The old homestead at Berry Springs Park in Georgetown, Texas is a broken down, decaying building. I thought I'd bring it back to life. I made a photograph in the early evening and then using Photoshop, I turned it into a night shot, did some digital restoration including building repairs, and added some lights and furniture. I filled in an empty window hole with an image of a skylight I made at the 10th District Court of Appeals courtroom at the Waco courthouse. I extracted a wagon wheel from a photo I made in west Texas and placed it along side of the building. I placed a couple of my photos on the walls. (One of the photos is the rear view of the homestead.) 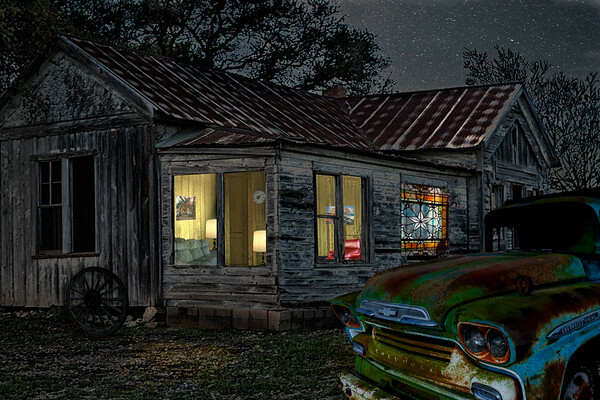 I then added an image of an old truck that I found in Walburg, Texas.